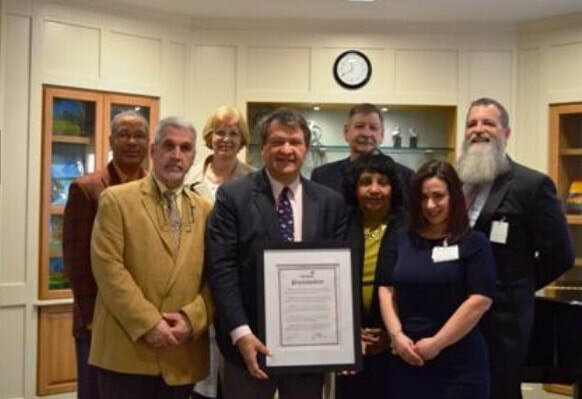 County Executive George Latimer recently visited Wartburg to talk with residents and staff to learn more about the healthcare and residential options provided by Wartburg in lower Westchester County and the Bronx. County Executive Latimer met with Wartburg President & CEO, Dr. David J. Gentner, Wartburg board members, and other senior staff to learn about the focus of post-acute rehabilitative outcomes and hospital partnerships as well as other innovative programs such as the Creative Aging & Lifelong Learning program, the SeniorU partnership with Concordia College, and the Institute for Music and Neurologic Function. “It was great to be able to provide an overview of Wartburg’s vision for caring of older adults to the County Executive. I was especially excited to highlight our plans for a modern rental option with its secure campus environment and excellent access to transportation.” said Gentner. County Executive Latimer also spoke to Wartburg’s Meadowview Assisted Living facility residents. He highlighted the programs available in the county and the proposed changes he is considering to ensure the oldest members of the community live with the independence and dignity they so richly deserve—a mission that clearly aligns with Wartburg’s. The talk ended with Dr. Gentner presenting the County Executive with a proclamation making him an honorary resident of Wartburg. The County Executive also visited Wartburg’s Adult Day Care program where he reunited with clients he has known through his career as a public servant in the region. He was welcomed with open arms—literally! He spoke about his passion for senior causes, jokingly saying he is not far from being a senior at 64 ½ years old. He stated he was happy to be able to affect the changes needed to ensure that seniors have the programs and services needed to maintain a good quality of life in his newly appointed role as County Executive.